A naturalistic, warm and inviting look, Southwest furniture takes its charm from both Native American and Mexican cultures. Southwestern furniture is solid and has a rustic appeal. After finding these wonderful pictures, I am a big fan. The colors and designs are just gorgeous. They speak of the color and beauty of the Southwest landscape and culture. 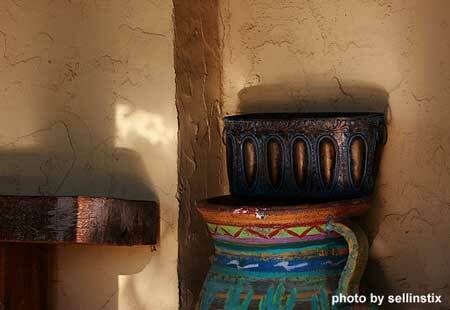 Typically, southwestern decor has a foundation color of neutral adobe or terra cotta. Southwestern style furniture is commonly adorned with iron, backs are made of slats, and is designed for functionality rather than form. Here are a few items Mary and I discovered that can begin transforming your porch into a Southwestern oasis. 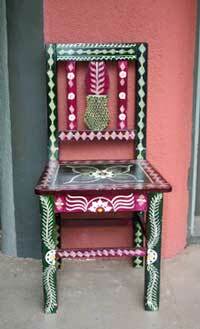 Available in a choice of colors, this southwestern style table will look amazing on almost any porch or patio. Add colorful cushions for even more comfort. Accent colors are greens and blues, both bold and muted, as well as warm yellows and oranges. Think of mountains and sunshine. Use our handy color guide to help determine great southwest color combinations. How Do You Get the Southwestern Look? Use Native American printed fabrics for chair coverings and add a few southwestern style throw pillows. They will liven up your porch and keep your theme alive. This cushion fits most wrought iron and mid-back porch and patio furniture. Try a beautiful, Navajo rug with simple, geometric patterns like diamonds or stripes for a real honest Southwestern flavor. You might want to add some beautiful pottery to your porch in earth tones to complete the look. 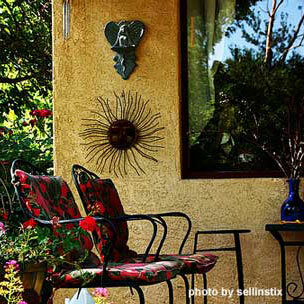 Scour garage sales, flea markets or the web to find other unique southwestern items to decorate your porch. Add a touch of southwestern appeal to your home with rusting wall decorations. 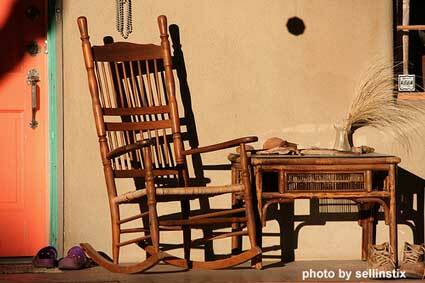 Cactus, old rustic gates, lanterns, well worn old wagon wheels, or old posts can all accent your southwest furniture. This style is somewhat minimalist so a few beautiful pieces of pottery or even a southwest painting on your porch would be perfect. Use acrylic paints, beads, feathers, leather, ropes, and colorful stone settings (such as silver and turquoise) to accent the colors in your southwest furniture pillows. 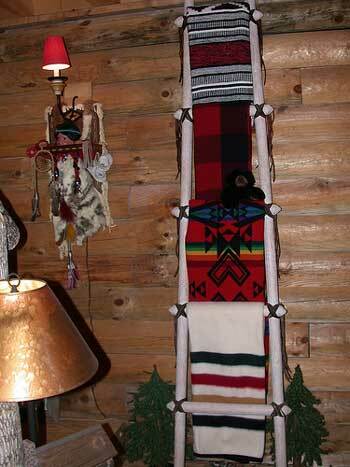 Use kiva ladders which are a uniquely Southwestern furniture piece. Used by the Hopi and Anasazi Indians to negotiate their cliff dwellings, today are used on porches and adorned with decorative items such as dried flowers, quilts, or comforters. Does the interior of your home have a Spanish influence? 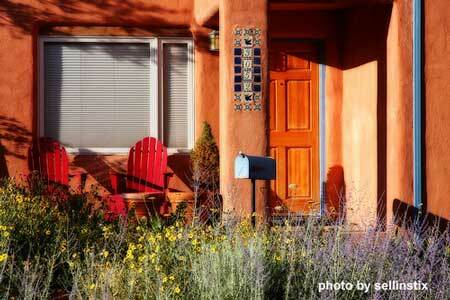 Carry the theme to your porch with a Southwest porch design. 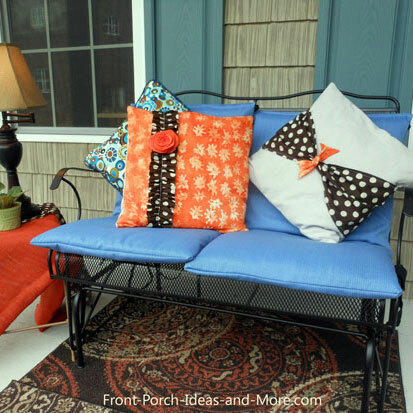 See how Mary recovered our outdoor cushions; you can do it too!